Notes: Set of three covers each with different postmarks to the original collection. I had a few covers remaining and so decided to do this small collection. Only 20 exist. The covers are numbered 106 - 125. Each cover features illustrations by a local artist. 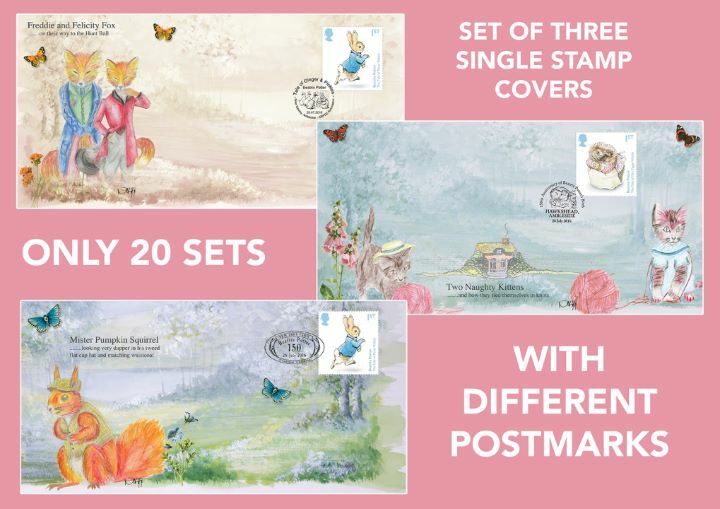 The above Royal Mail Beatrix Potter stamps were issued on 28 July 2016 by Royal Mail and feature the following stamp designs: 1st Peter Rabbit; 1st Mrs. Tiggy-Winkle; £1.33 Squirrel Nutkin; £1.33 Jemima Puddle-Duck; £1.52 Tom Kitten; £1.52 Benjamin Bunny. The Three Alternative Postmarks - Single Stamp Covers first day cover with the Near Sawrey, Three different, Special Handstamp postmark has been produced by Bradbury and features these stamps which can make a very collectible and lovely gift.